… the new study, published in August in the Scandinavian Journal of Medicine & Science in Sports, finds that a single exercise could be even more effective. It requires standing barefoot on the affected leg on a stair or box, with a rolled-up towel resting beneath the toes of the sore foot and the heel extending over the edge of the stair or box. The unaffected leg should hang free, bent slightly at the knee. 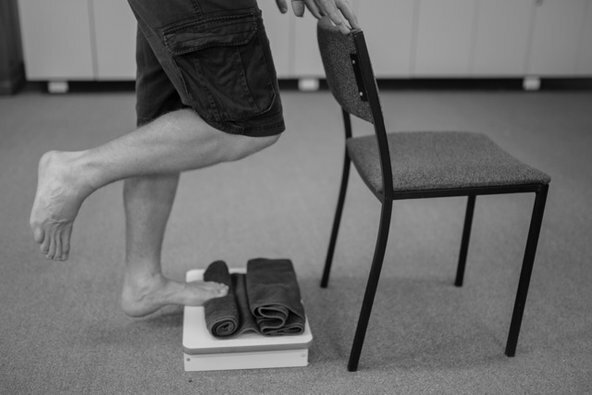 Other volunteers completed a standard plantar fasciitis stretching regimen, in which they pulled their toes toward their shins 10 times, three times a day. After three months, those in the exercise group reported vast improvements. You can check out the rest of the article here: http://nyti.ms/1m9emw9. After doing so, I yelled, “Books and towels!” at my computer in appreciation. While I have some skepticism, I’m more enthusiastic about a strengthening exercise than increasing pain medication. Towels and books are a hell of a lot cheaper (and less invasive) than cortisone injections.